Are AC Milan really going to sell Balotelli? When Mario Balotelli arrived at Milanello in January 2013, it looked like a match made in heaven. The Italy striker was an AC Milan fan as a youngster and his time at Manchester City had run its course. He needed a fresh challenge. The Rossoneri, meanwhile, were looking for a leg-up in their push to regain their status of old. They required a player who could fit in with Stephan El Shaarawy and M’baye Niang in their grand vision for the future. “Arsenal have already approached Milan about Balotelli. The Rossoneri want to get rid of all the players associated to Mino Raiola – with Barbara Berlusconi key to this sea change – and Balotelli is top of the list. “The decision on Mario’s future doesn’t appear to be a choice related to whether Milan qualify for the Champions League or Europa League for next season, rather it is a strategy focused on getting as much money as possible out of the situation. On opening night against Udinese, Balotelli’s box office billing appeared more than worthy. He immediately showed signs of an understanding with Niang, and by half-time he’d already registered his first goal in black and red from an El Shaarawy pull-back. Later, he would smash in a match-winning penalty. The future appeared to be in safe hands. But little more than a year later, the great Balotelli project seems to be on altogether more rocky ground. On Friday, the 23-year-old netted a stunning late winner against Bologna at San Siro, yet it came after the latest in a string of unconvincing performances. His movement was again laboured, his interest in the scrap questionable, his relevance to the game as a whole minimal. The very fact that Milan sit in ninth says much about how the last year has gone. If anything, they look a worse team now than they did this time last year, and the bright young hopes have all fallen short of expectation for various reasons. Niang has been sent on loan to Montpellier after failing to score in 28 league games in Italy, with off-field trouble also having followed. El Shaarawy has played just 92 minutes in all competitions during the last five months due to injury, coming off the back of a dip in form which coincided with Balotelli’s arrival in Milan. And the main man himself has yet to show that he can become the more rounded, all-encompassing target man that coach Clarence Seedorf appears to want him to be. 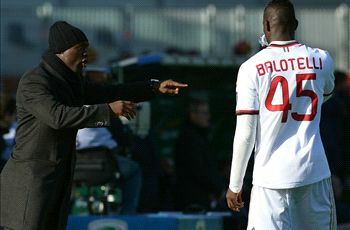 Balotelli stated after Friday’s winner that he feels the need to lead the Rossoneri from the front. “The coach gives me confidence, as I am the one who has to pull the team forward and therefore it’s my duty to score these goals,” he told Sky Sport, yet he has often left them lacking a real focus and energy in the forward line. He has netted 26 times in 40 games in Milan colours, but nine of them have come from the penalty spot and a further four from free-kicks. What remains is a tally of 13 goals from open play. Giampaolo Pazzini has scored the same number in 36 games for the club, only 16 of which have been starts. In general play, Balotelli often lacks the dynamism one might rightly expect from a player who away from the field appears to carry so much effervescence and verve. He may have the desire to be the very best, admitting to Goal recently that he sees himself as a potential Ballon d’Or candidate – “Of course it is an ambition for everybody, and it is certainly an ambition for me” – but this objective is belied by his body language on the pitch. It is an attitude which now sees him close to the exit door at San Siro. With Milan struggling to make any real impression on the Serie A table, Balotelli looks likely to be sold in a bid to raise funds for a new project. President Silvio Berlusconi, who called the striker a “rotten apple” shortly before his arrival in Milan, was left fuming by the No.45’s approach during the winter break and demanded that he be sold in January. “I’ve had enough and the decision is made,” Secolo XIX quoted Berlusconi as saying. “Mario is officially on the market and we need to sell him before the end of January.” The ex-Inter man might have survived the transfer window, but it seems little more than a stay of execution, with Silvio’s daughter Barbara wanting to move out all players linked to agent Mino Raiola. With Balotelli having been purchased for €20 million with additional performance-related costs, the Rossoneri could well make the most of his sell-on value should he perform well against Atletico Madrid this week in the Champions League round of 16 first leg. With the decision already made that the forward can leave, it seems that any star showing now will be greeted as warmly for its weight in the market as for its boost on the field. Balotelli’s demeanour, Milan’s results and the Berlusconi family’s lack of patience are proof enough that last January’s move has simply not worked. The end of the great love affair is nigh.